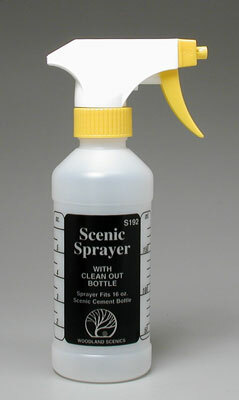 This is Woodland Scenics' Scenic Sprayer Bottle. Screw-on spray head and extra long siphon tube that will fit the 16oz Scenic Cement (WOOR1401) bottle. Spray output is adjustable (fine mist to a steady stream). Milliliters and ounce measurements marked on the bottle. Instructions are listed on the backside of the bottle.